As people, we like what we like. We have opinions on a wide variety of subjects, some of those are important and others not so much. Take for example toilet paper distribution. 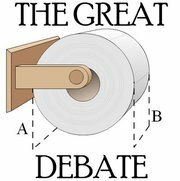 How do you prefer your toilet paper to come off the roll? Are you an “over the top” person or do you prefer to pull it off “from under the bottom”? Recently I was in a fine eating establishment and visited the restroom facilities. I noticed that in the stall there were two toilet paper holders. The first held the toilet paper so that the paper was distributed from the top. The second held the paper so that the toilet paper was accessed from the bottom. And it was at that moment that I Corinthians 9:19-23 came to my mind. This fine eating establishment was attempting to be all things to all people, catering to their customers in an effort to “win them over” and keep them coming back. As cross-cultural missionaries, Dana & I must understand and embrace the essence of this passage. We must understand the culture we are moving into, embrace it, share in it, and love it so that we may, as Paul states, win more of them – for the sake of the gospel – so that we may share with them in its blessings. We are under no delusion that this will be easy. We know that there will be difficult days ahead as we attempt to understand the Ghanaian culture in a way that we can be effective with the Gospel. And that is why it is so important that we have friends like you praying for us EVERY DAY. It is only in the power of Christ that we will be able to succeed. Thank you for praying for us. If you would like to be on our personal prayer team, praying for specific things we only share with our prayer team, email me at chris@teamholloway.com. So although I may be an “over the top” kind of guy, I must be willing to be an “under the bottom” kind of guy so that I can reach the “under the bottom” kind of people. Not to convince them that “over the top” is the better way, but to win them over to the truth of the Gospel. Are you willing to become all things to all people for the sake of the Gospel? Let’s do it together. Let us know how we can pray for and encourage you as you live this out where ever you are. I pray for you everyday, all your life. Will continue to do so till God takes my breath away. I love you and God loves you, you are his child. God only loaned you to me to raise and now he has his hands on you to take care of the rest.